I love sunroofs. The only car I’ve owned without a sunroof was a Miata. While I haven’t owned a car with a panoramic sunroof, I like panoramic sunroofs, because a bigger sunroof is obviously better than a smaller sunroof. Except, maybe, having a movable glass panel over your head in a crash isn’t safe? Hyundai’s in-house parts division Hyundai Mobis just announced that they’ve invented and patented a panoramic sunroof airbag. They also put out this video. 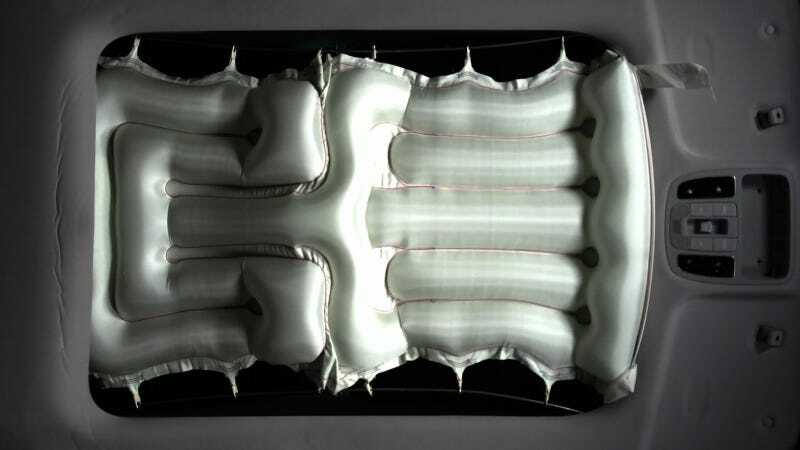 When the vehicle is overturned, the airbag is deployed in 0.08 seconds, preventing passengers from being thrown out of the car through the roof. As the sunroof airbag prevents the passenger from spilling from the car in a rollover accident, it can reduce the risk of sustaining serious injuries. In a road test using dummies, when the airbag was deployed, it prevented the passenger from being flung out of the car and cushioned the impact on the head. Serious injuries likely to result in the death of the passenger were reduced to minor injuries. Wait a minute Hyundai Mobis, are you meaning to tell me that cars with panoramic sunroofs but no panoramic sunroof airbags can cause serious injuries likely to result in the death of the passenger? Because, uh, I like sunroofs, especially big ones, but I also don’t like serious injuries likely to result in my death. Hyundai Mobis doesn’t have a timeline of when cars will start getting these panoramic sunroof airbags, or which cars will get them, or since Hyundai Mobis patented them, if any non-Hyundai/Kia brands are going to buy them. But they’re on their way at some point. It’s almost as if the car companies who are all selling us panoramic sunroofs decided that they could come up with a feature that sunroof-loving consumers would gladly pay a couple extra thousand dollars for without stopping to think if maybe there was a downside other than negatively impacting trackdaybros.